A CRM made for designers, one that even the pickiest designers will love, OnePageCRM has everything you need to manage your leads and sales pipeline, build better relationships with your prospects, and close more sales. What a CRM for designers looks like. A clean and streamlined interface to focus you on the task at hand. A cloud based CRM to capture and manage your sales leads and pipeline. Most of all, a CRM for designers must make it easy for you actually close more sales. 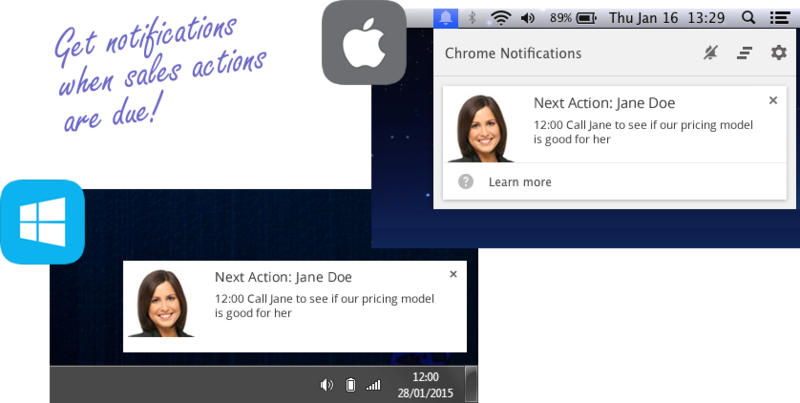 What does a great cloud based CRM for designers look like? It should get you organized and tell you which tasks and relationships need your attention. Like a dedicated digital assistant, devoted to your success, OnePageCRM makes your job and your life easier. The right CRM for designers. The right CRM for designers is also easy to set up and use. It should be intuitive and just make sense to you, starting with your first look. The best CRM for designers should eliminate your stress points, leaving you free to focus on growing your design business and winning more clients. The right CRM for you helps you take care of the prospect and client management tasks in record time, giving you more time to do the great work that turns your clients into raving fans. Your design-business CRM should also show you at a glance the bird’s-eye view of your business and then let you drill down to specifics, so you can swiftly manage both the big picture and the details. 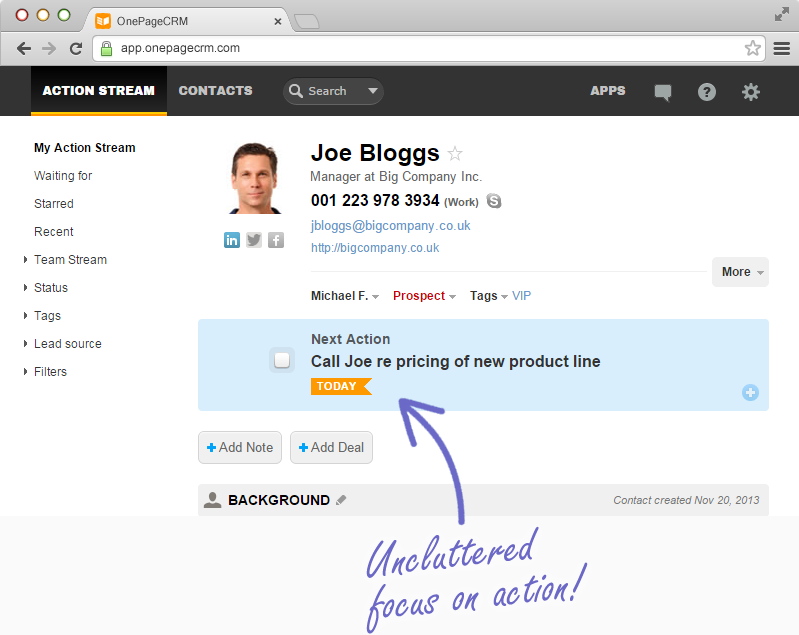 Specifically a clear and easy to manage view of your sales pipeline. And finally, the well-designed CRM for designers recognizes that not every design project is the same. So it should make it easier for you to create different sales pipelines for each client, with custom-created fields and processes with unique workflows. Manage the design process. We think OnePageCRM is the best cloud based CRM for designers, and we’d love the chance to prove it to you. No CRM for designers (or anyone else) can be called useful if a clunky, cluttered design makes it a chore to use. 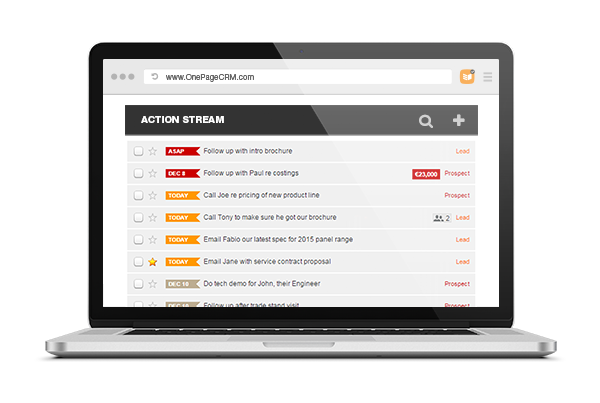 OnePageCRM boasts a sleek, intuitive design that’s streamlined to focus your attention on the specific task at hand. We ruthlessly cut out any extraneous design elements, so nothing will distract you from managing the sales and design process. Finally you can get and stay organized. You’ll find yourself wanting to use OnePageCRM every day, which is the real key to a successful CRM. We’re so sure of that, we’ve created a generous 21-day free trial period to prove it to you. Sign up for our free no-obligation trial to see the best CRM for designers in action and try it out for yourself.